Being constantly tired is a common complaint with people of all ages, from high school students to elderly retirees. However, many people complain of more exhaustion than they experience. For those who deal with constant fatigue, it can be debilitating and can seriously impact a daily routine. 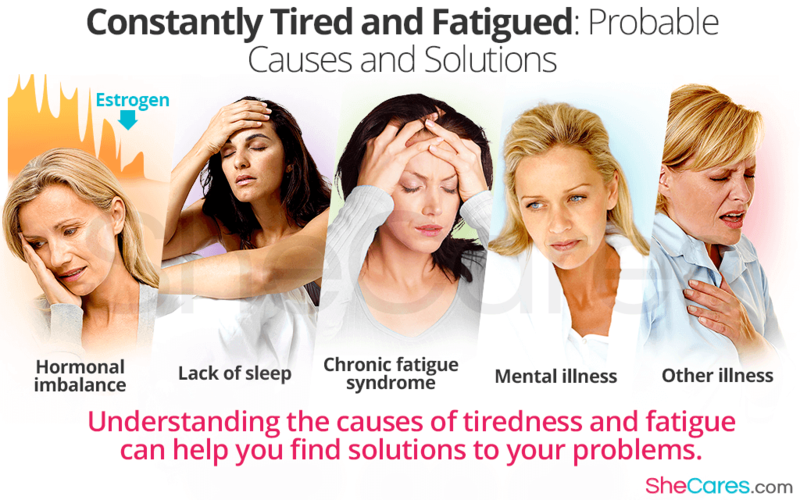 Learn more about the causes of constant tiredness to help find solutions to your problem. What Causes Constant Fatigue and Tiredness? Many women will experience an imbalance in their hormone levels at some point during their lives, especially during menopause. A decrease in estrogen is the most common imbalance that occurs during menopause, and low levels of estrogen can have significant effects on the body, including damaging the body's ability to sleep and increasing the likelihood of fatigue. The simplest explanation of why you may be tired is that you are not sleeping enough. Adults need 7 – 9 hours of sleep per night, but many people sleep less. Additionally, even those who do manage to spend seven or more hours in bed could be missing out on sleep - a sleep disorder like sleep apnea can interrupt your sleep without you knowing. One of the most well-known illnesses that causes tiredness, chronic fatigue syndrome is characterized by extreme exhaustion that is not improved by rest or sleep, lasting six months or more. This syndrome causes debilitating tiredness that impacts daily life and routines. If you are suffering from a mental illness, especially depression, it may be the reason for constant fatigue. Neurotransmitters in the brain are responsible for managing the brain's health and for controlling mood, energy, pain, and a number of other factors. Because mental illnesses affect the brain and neurotransmitters, they can affect energy levels as well. Most other causes of extreme constant fatigue are likely to be caused by another illness. Many diseases like thyroid problems, heart disease, or anemia can cause fatigue and tiredness as a specific symptom. How Can Constant Tiredness Be Managed? Some other ways to manage constant tiredness and fatigue are to make a few lifestyle changes. While they may be a solution, they can help make it easier to deal with. Physical activity. Exercise regularly, unless you have chronic fatigue syndrome or a similar illness. Stress management. Find ways to reduce or relieve stress such as through meditation. Balanced diet. Eat healthy foods with plenty of protein like dairy products. Sufficient rest. Sleep a full 7 – 9 hours. Are There Treatments for Constant Fatigue? NADH to help the body produce more energy. Magnesium to reduce feelings of fatigue. Melatonin to help increase restful sleep. Some of the illnesses that cause tiredness may have medications that can solve the underlying cause, thus eliminating the tiredness along with the illness. A doctor should be consulted to decide on medicinal treatment for tiredness and fatigue. If your constant fatigue continues for six months or more, you may have chronic fatigue syndrome, especially if you are also experiencing pain. Find out about the symptoms and management of chronic fatigue syndrome. Is Chronic Fatigue Common in Women?